Exploring the origins of James T. Kirk, Spock, McCoy, and the crew of the U.S.S. Enterprise from the original Star Trek series, the film and novelization reveal how these iconic characters came together. However, these are not the heroes we expect: They are just cadets, fresh from Starfleet Academy, inexperienced and trying to find their way. One man knows that if he and the Enterprise’s crew can pull them apart—or, if fortune favors him—kill the entire crew—then perhaps his people, rather than Kirk and his Federation, will rule the galaxy. love the movie but also love the book too. you can tell Zachary gets into the characters. I very much enjoyed this audio book. The reading and voice acting is superb. I saw the movie so the story was not new to me but still great. 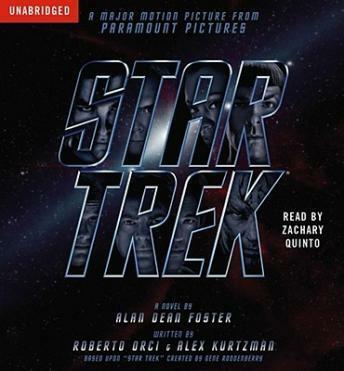 I highly recommend this audio book to all fans of sci-fi and Star Trek. It's one of best ways of spending 8 hours that I can imagine. This is my first book by Alan Dean Foster and I enjoyed it. I am a fan of Star Trek and was interested to read about when the stars were in Space Academy. Do not know if was good or bad but I picture each of the crew as they were portrayed in the T.V. series. The book had a young James Kirk as a young trouble maker, very bright and easily bored, and Spock as the winner of all the academic awards. Look forward to more Star Trek books.